We have an amazing 15th episode of the newest podcast under the MULTI-MEDIA MEN banner called ‘Media-Ocrity‘, where the show is just – okay. Here on the show, we focus strictly on horror/sci-fi, comic books, and video games – basically all the fun stuff that tickles your fancy. In our fifteenth episode, titled ‘I Went To Fantastic Fest and took on Bruce Campbell and Andre Gower‘, we discuss all of the amazing films at Fantastic Fest, Cult Films, Bruce Campbell, re-mastered video games coming out in October, and more. This episode is guaranteed to thrill you, chill you, and fulfill you. I am joined pop-culture wizard Jonathan Atterbury and comic book artist Jeremy Megert. 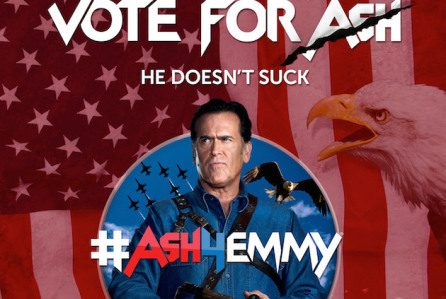 #Ash4Emmy Jump On The Bruce Campbell Bandwagon!!! We’ve all been inundated with bids for our votes lately, national politics, school board nominees and now…the Emmy’s? I’m getting sick of the ads and the smear campaigns that are prevalent everywhere and I don’t want to see another candidate stumping – except this one. 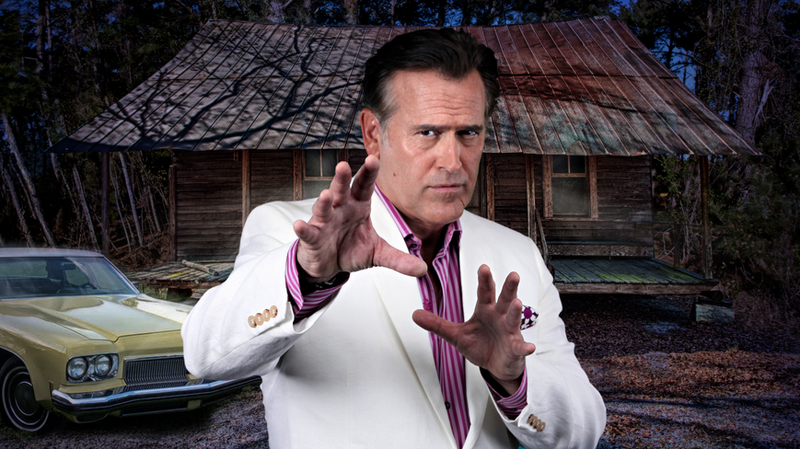 Bruce Campbell makes everything groovy, including vying for an Emmy nomination. If you’re sad that TBS canceled ‘King of the Nerds‘ after 3 seasons, rest a little easier knowing that another reality competition series is amping up and shopping for networks to host the game show that will be very similar to the formula KOTN used with one little twist – Take out the “nerd” and sub in “horror”!!! 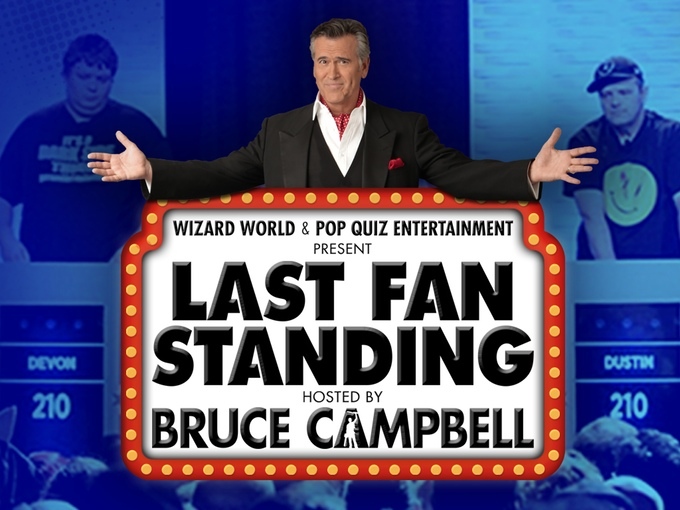 We’ve reported before that Bruce Campbell and Wizard World have collaborated in bringing ‘Last Fan Standing‘, a game show for the nerds among us to life. It makes Comic-Cons more awesome because that’s where they film, and it makes reality TV so much more fun as it’s part of Wizard World’s ConTV. Bruce has run into a problem and needs our help though! This show can’t come fast enough. We’ve seen a couple of very small teaser trailers and some behind the scenes photos but this is the first time we see Bruce Campbell as Ash in full costume for Starz’s new show ‘Ash vs. Evil Dead‘. I just can’t wait. The photo is courtesy of EW. 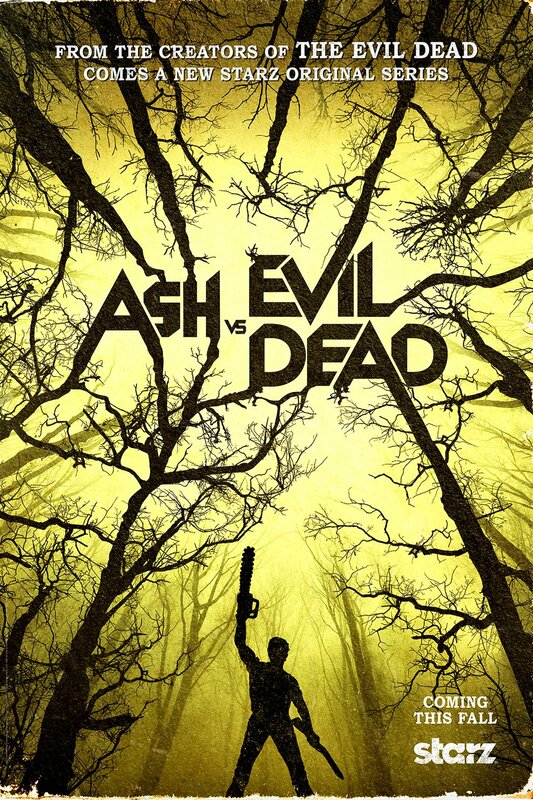 Bruce Campbell as Ash Is Back For Evil Dead Series !!!! For years, fans of the cult horror film franchise ‘The Evil Dead‘ may have uttered Ash’s line, “You bastards, why are you torturing me like this? Why?” when we hear rumblings of new films in the works. Starz has made an announcement today that will breathe new life into the dead series. We told you earlier that the premium channel was looking at the films as inspiration for an adaptation to series. 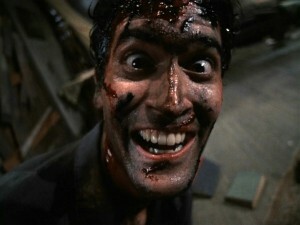 It’s Gonna Be a Bruce Campbell Day At MondoTees!! The amazing staff at Mondo has just announced that at some point tomorrow, they will release the remaining copies of ‘Army of Darkness‘ by Randy Ortiz from their screening a month ago in Kansas City. 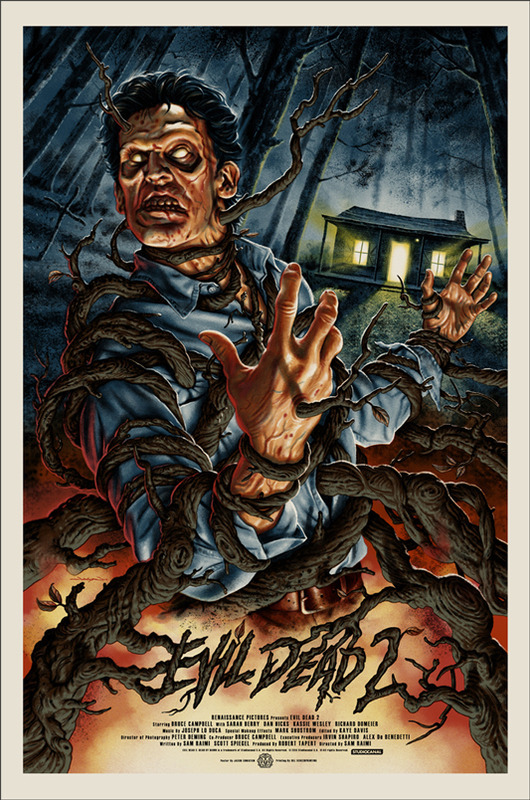 Along with that amazing print, they will release an all-new beautiful work of art by Jason Edmiston for ‘Evil Dead 2‘. Lastly, Mondo will be releasing their 3rd leather bound book titled MONDONOMICON, you know to go along with the theme of all that is Groovy! 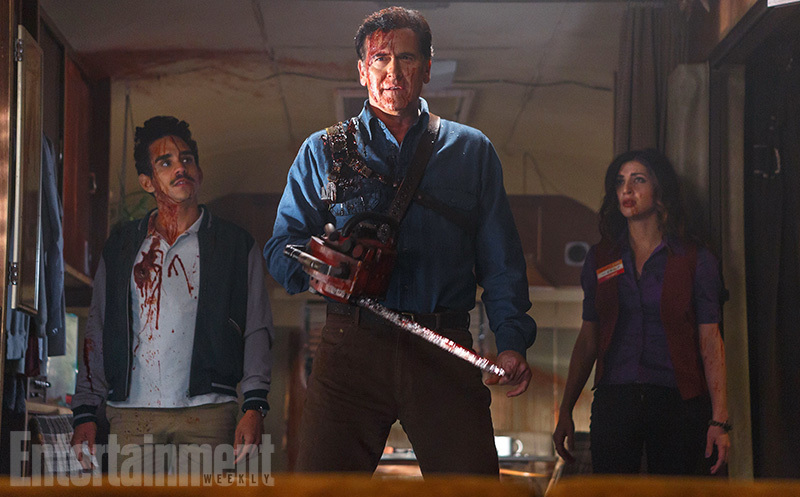 Bruce Campbell Talked About That ‘Evil Dead’ Remake at NYCC!!! 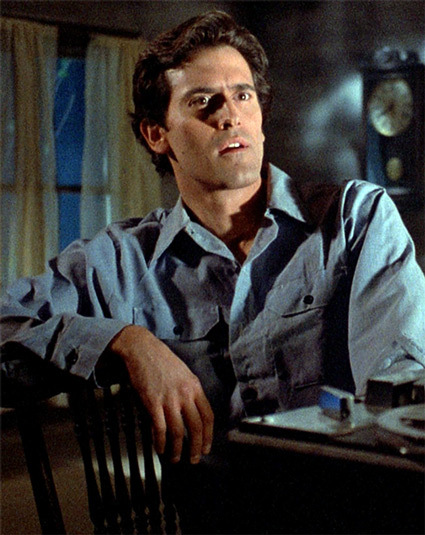 This past Saturday at the New York Comic Con, Bruce Campbell unleashed tons of information, answered rabid fan’s questions, and even showed footage from the highly anticipated remake of Sam Raimi’s 80’s horror film ‘The Evil Dead’. Also in attendance at the ‘Evil Dead’ panel was director Fede Alvarez and the movie’s main star, Jane Levy. 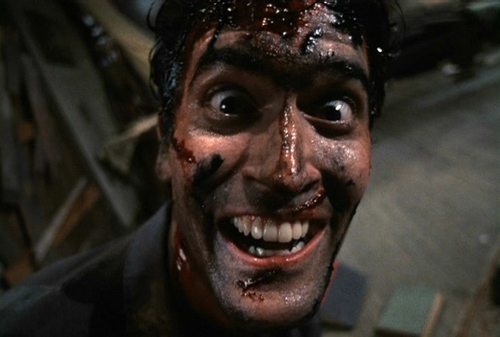 Bruce Campbell Approves the New ‘Evil Dead’ Remake!!! 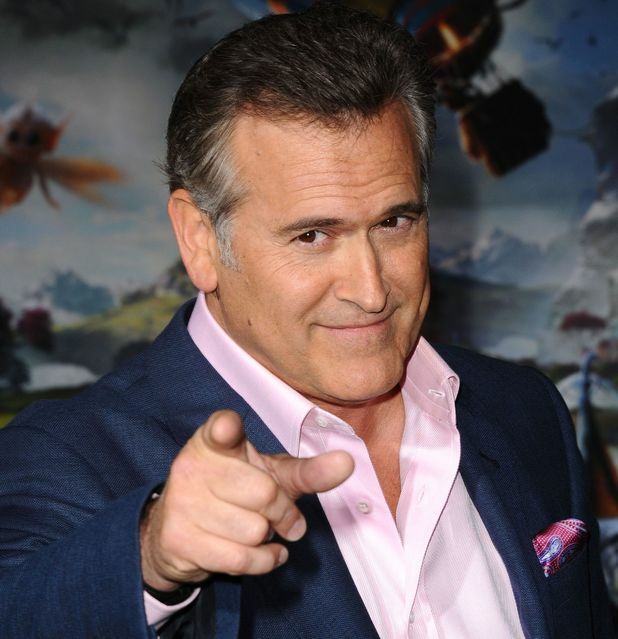 Bruce Campbell Talks About His “Burn Notice” Movie!!!! If you are a fan of the hit show “Burn Notice” then you have probably heard that there is going to be a tv movie prequel called “Burn Notice: The Fall of Sam Axe” which is supposed to be a prequel to the show. Bruce talks about why it’s a good idea to watch the film before starting season 5.